"I told him to bring his gear with him, because you never know what might happen," said Meyer. "Eddie met with Mark Morris [Head Coach], who I had the pleasure of coaching with when I was an Assistant for the Manchester Monarchs in the American Hockey League. Following their meeting, I spoke with Mark as well, and we got Eddie on the ice as a practice player for the Saints." Pavlini began the year with the Saints by helping out in any way that he could during the team's practice sessions. 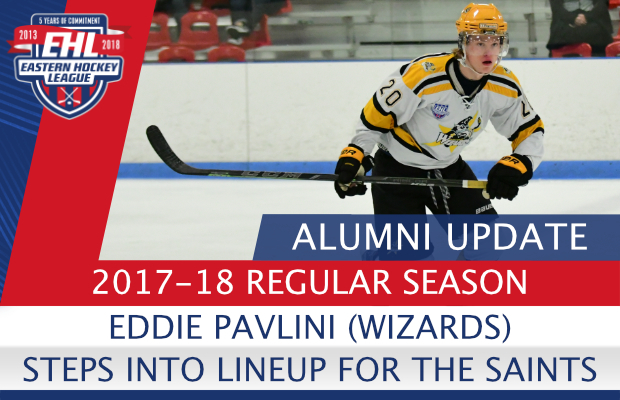 After a few injuries, Pavlini began working his way up the depth chart. As of today, he's played in 5 total games since making his collegiate debut back on November 17th against Cornell University. "When I arrived I connected with Coach Morris through Freddy and he said that at the time their roster was set, but to stay in shape in case anything happened," said Pavlini. "He called me early into the season asking me to come skate and they decided to keep me on board. My time practicing and playing in the EHL helped me develop over time, but I especially learned a lot from Freddy. This past year he taught me about the keys to preparation, taking care of my body, and putting in extra time to improve myself as a player." The Saints hit the ice next this upcoming Friday and Saturday, when they travel to take on Princeton University and Quinnipiac University. We will keep an eye to see if #8 is in the lineup, but we do know regardless of whether he is or he isn't, Pavlini will be ready. Catch all of this year's action live on HockeyTV, and be sure to follow the Wizards on social media (Facebook, Twitter, and Instagram), for all the latest news and updates.